GENE TYNDALL THE MAN WHO COINED THE TERM "SUPPLY CHAIN"
Industry veteran Gene Tyndall was recently inducted in the Global Institute of Logistics ‘Hall of Fame’. The announcement of its annual “Hall of Fame” inductee is one of the Institute’s primary products of annual research. The Institute’s Hall of Fame serves as a way to recognize distinguished members of the global logistics community. Those elected to membership into the Hall of Fame represent the highest achievement in their field, serving as models of what can be achieved and how. Each year the Institute invites the Executive Directors of its various councils and chapters globally to nominate individuals for induction into the Institute’s Hall of Fame. 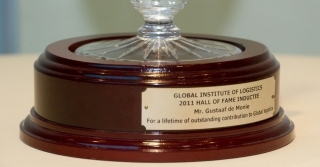 Gene Tyndall was formally inducted into the Global Institute of Logistics ‘Hall of Fame’. 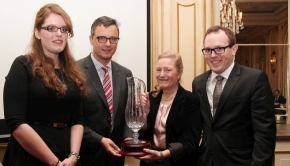 Kieran Ring, CEO of GIL, presented Gene Tyndall with the Waterford Crystal Claret Jug, in honour of his remarkable contributions to the industry. Many of Gene’s friends and colleagues attended the celebration to congratulate Gene on his achievement and many of the guests spoke of why they felt he was chosen for such an honor. After Kieran welcomed the group and thanked everyone for coming Paul Goldsbrough, of Hellmann Worldwide Logistics, was first to speak. He spoke of how, despite Gene’s obvious success, he had remained ‘humble and yet knowledgeable’. It was this modesty that Paul said he admired most. Chris Monroe, a close friend of Gene’s, spoke of what he called the “Tyndall Magic”. This magic, Monroe explained, was Gene’s ability to make the people around him feel comfortable. He explained how Gene brought out the best in the people that surrounded him, while creating a comfortable and enjoyable working environment.Gene himself took to the floor and in true Tyndall form regaled the room with a light hearted story of how he first got involved with Dell. He explained how his daughter had ordered one computer from Dell and had received two. Gene immediately brought this error to the attention of Dell’s head office and how it helped to make their supply chain more efficient. Gene explained how sometimes it’s a “screw up” that makes companies more efficient. Ben Cook, from Kimberly-Clark, spoke. Ben, spoke of his admiration for Gene and how he felt that from Gene he had learned the skill of always keeping the big picture in mind and the importance of relationship building. Razat Gaurav, a former employee of Gene’s from Ernest & Young, described ‘Gene’s legacy’ as being the obvious enjoyment he gets from his work and how he encourages others to enjoy work in the same way he does. Razat, feels that the best has yet to come. “Gene’s been recognised with this honour tonight but I feel we are only getting started with Gene, he has ways to go.” Mike Shelton, a former employee of Gene’s spoke of how they worked as evangelists for supply chain at Ernest & Young. The aspect of Gene’s success that Mike was most impressed with is the tireless efforts he puts into working with clients and promoting the supply chain. The extent of the Tyndall magic was clearly shown when Eric Kulich from American Shipper who had met Tyndall for the first time on the day of the meeting felt he could stand up and justify why Gene had been given this award. Eric described Gene as a “bridge builder” on which others can follow. “The logistics industry is made difficult by us”, he explained, but the point everyone here tonight has been making is that “Gene makes it enjoyable”. Gene congratulated the Institute on their recent successes and advised the attendees of the meeting support the work of the Institute to help make a difference in the industry. As Gene said the Institute doesn’t ‘promote logos, it only promotes learning’. The logistics industry in general is all about people, Gene explained, you start with your models and tools but “as you grow its all about people”. Gene referred to a book by Jim Collins called “Good to Great”, which emphasised the need to find the right people first and then decide on your plan of action. As Gene said “If we learn about people we do a better job”. Kieran presented Gene with the Claret Jug. While handing over this beautiful piece from Waterford Crystal Kieran spoke of Gene’s outstanding contribution to the industry and described Gene as a “deserving inductee”. The floor was then passed on to Chris Monroe who brought the evening to a close. With “6 million frequent flyer miles” already clocked up we have no doubt that Gene Tyndall has some miles left to go and the industry looks forward to working with him in the future. Gene Tyndall is currently President of Supply Chain Executive Advisors, LLC, (SCEA), a global firm comprised of senior executives who provide strategic advice and management counsel to senior business and public officials around the world. Gene is a globally experienced and recognized management consulting and business executive, having advised over 100 corporations in over 40 countries. Gene started his career as a U.S. Navy officer, serving on an aircraft carrier and at the Pentagon each for two years. He has a bachelor's degree in industrial engineering from the University of Maryland, and an MBA in marketing and management science from George Washington University (GWU) in Washington, DC. He completed all course work and examinations for his doctorate, but did not complete his dissertation. He co-founded the Center for Advanced Supply Chain Management at the University of Miami, Florida, where he occasionally assists in teaching corporate seminars. "When I left the Navy," recalls Gene, "I had two offers -- one from IBM and one from Research Analysis Corp. (RAC), a defense contractor in Virginia. One of my favorite professors at GWU was an officer at RAC, and he convinced me to join that organization, where I started doing logistics consulting for the armed services. This was my entry into logistics Gene next joined Boston-based consulting firm Applied Decision Systems, which was subsequently acquired by Temple, Barker and Sloan (TBS), which in turn was acquired by Mercer Management Consulting. He lived in Boston for three years working on corporate logistics and logistics software, and then relocated back to Washington, DC to open a TBS office there. In the late 1970s, Gene was asked to join the U.S. Department of Transportation to work on deregulation of motor carrier, rail, and aviation. Carl Sloane at TBS said, "Do two years in the government and then come back to us," Gene remembers. "I worked with John Snow, who was Assistant Secretary for Policy at DOT at the time. We developed the legislative proposals and worked with many interests and Congress to get that legislation passed." John Snow, who later served as Chairman of CSX Corporation and then Secretary of the U.S. Treasury from 2003 to 2006, and Gene became good friends during that time and remain so today. In 1981, Gene left the US DOT, but instead of returning to TBS, was recruited to Ernst & Young, which had started a national practice in transportation consulting. Gene was concerned that E&Y was a leading accounting firm, but he decided to "take a chance that the so-called 'Big 5' could build management consulting practices as well". Of course, they all did in major ways! "At the time," he remembers, "we were mostly doing studies for the government. I wanted to return to commercial work, so I suggested we change the practice name to Transportation and Distribution. I recruited Pat Byrne from Schneider National in Green Bay to lead our trucking business. 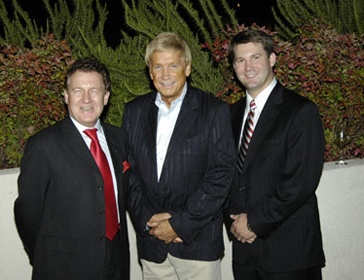 I recall that Don Schneider (founder of Schneider National) told me that Pat was one of his best Schneider managers". (Byrne is now managing partner of Accenture's Global Supply Chain Management business unit). "Pat and I expanded our practice, and I started working on aviation matters, on distribution issues for manufacturers, and on logistics matters for other clients," says Gene. "In the late 1980s, we changed the name of the practice to Logistics, and in 1993, changed it again to Supply Chain Management to reflect the evolution of that term and process." Gene is very proud of his and his partners' work at E&Y, building the practice to over 1,000 consultants globally, and designing supply chains for some of the world's leading corporations. For example, "together with Chris Gopal, and others," he recalls, "we helped Dell set up its original supply chains. Dell's supply chain management has been the envy of many over the past 15 years." Gene has lived in four countries and worked in over 40 nations. "During the '90s, I was outside of the United States more than I was in it," he laughs. "I was helping the growth of our practice globally, and I was determined to make it the best in the business. That's why I have over five million frequent flyer miles." Along the way, Gene worked as a supply chain consultant for more than 100 well-known corporations. Although Gene had several offers to join client companies (IBM, for example), it wasn't until the latter months of 1999 that he decided to do so, joining Ryder System, Inc. in Miami, as Executive Vice President and President of the company's Global Logistics Division, a $1.8 billion business unit. In addition to initiating substantial improvements in profitability and shareholder value, Gene helped transform Ryder's business processes and operations; and initiated new technologies, change management, and knowledge management programs, as well as a new product development process. He also was a co-leader of the corporation's Strategic Planning Process. At Ryder, Gene served many of the same companies he'd worked with while at E&Y -- Dell, Ford, GM, Cisco, GE, and Samsung, to name a few. He spent almost four years at Ryder, leading the third party logistics provider (3PL) during its ranking by Inbound Logistics as the #1 provider. "I'm proud of what I and others accomplished and initiated in the years I was at Ryder," says Gene, "but I wanted to go back to consulting. 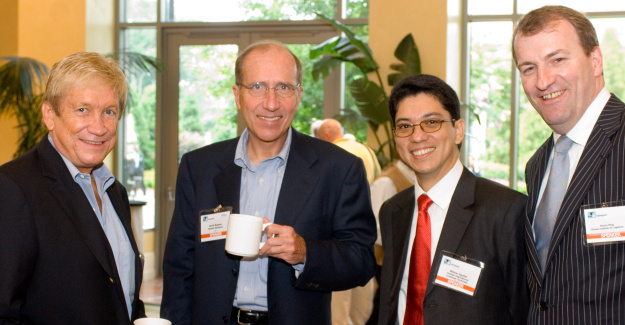 In 2003, I co-founded our small global executive advisory services firm, Supply Chain Executive Advisors." The firm includes former E&Y supply chain partners around the world, as well as some Ryder ex-patriots. It also has working alliances with trusted other firms, providing senior-level advice and counsel to executives all over the world on supply chain management, technology, and operations. In addition to his Supply Chain Executive Advisors responsibilities, Gene serves as a member on three corporate boards of directors, and several advisory boards. Gene has co-authored four books and, together with Chris Gopal and Lisa Harrington, is at work on the fifth, this one on the Myths of Globalization. He is very active in the Council of Supply Chain Management Professionals (CSCMP), having served as conference chair for the 1996 annual conference in Orlando, the best attended conference in the history of the organization. In addition, Gene has been a track chair for CSCMP's annual conference at least seven times, and a speaker at nearly every CSCMP Annual Meeting since 1982. "My interest these days," says Gene, "is three-fold. First, I really enjoy advising senior executives as to the importance of supply chain management in today's global business world, and what they should do to improve their company's performance. Secondly, I enjoy helping supply chain and logistics executives communicate to their 'C-level' leaders, and their corporate peers, in terms that make a difference. Each group often uses a different language to describe their business activities, and that typically results in confusion and misunderstandings in the executive suite. I try to help the two groups communicate better so they can really understand what opportunities they have to transform their business." And lastly, Gene works with companies to improve their marketing and selling processes. "We learned 'Solution Selling' at E&Y, refined it at Ryder, and with numerous clients in all industries," Gene explains. "Solution Selling results in major changes in the ways that client organizations go to market and succeed in today's highly competitive world." "Looking back over my career, I am very pleased with the role I've played in helping to advance the disciplines of logistics and supply chain management during my career," Gene says. "Along the way, I have developed many friends in the profession around the world. Supply chain excellence is a journey," Gene concludes, "and one I plan to continue exploring, discovering and assisting." Industry veteran Gene Tyndall ,the Man Who Coined the Term “Supply Chain” was recently inducted in the Global Institute of Logistics ‘Hall of Fame’. The announcement of its annual “Hall of Fame” inductee is one of the Institute’s primary products of annual research. Those elected to membership in to the Hall of Fame represent the highest achievement in their field, serving as models of what can be achieved and how. Each year the Institute invites the Executive Directors of its various councils and chapters globally to nominate individuals for induction into the Institute’s Hall of Fame. These nominations feed discussions about what constitutes excellence and success in individual logisticians. The goal is to improve global logistics practices by identifying the outstanding logistician in the field over the course of a lifetime. Kieran Ring, Chief Executive Officer of the Institute, presented Gene Tyndall with the Claret Jug, a beautiful piece from Waterford Crystal, in honor of his remarkable contributions to the industry. 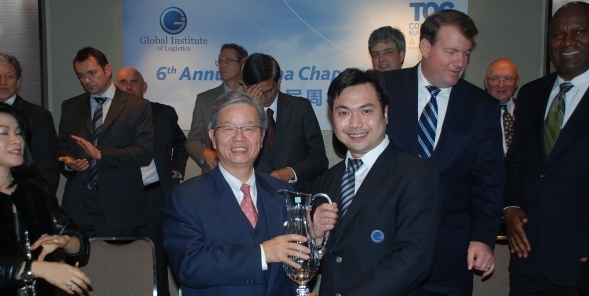 Many of Gene’s friends and colleagues attended the event to congratulate him on his achievement. Throughout the course of the evening guests spoke of why they felt he was chosen for such an honour and how thatdespite Gene’s obvious success, he had always remained humble.Gene’s ability to make the people around him feel comfortable in order to get the job done was especially lauded on the night. “I am delighted to announce the induction of Gene to the Institute’s Hall of Fame; he is a worthy successor to Bob Delaney who was our inaugural recipient and founder of the Institute. There was absolutely unanimous support for Gene’s nomination; no matter who we spoke with across the length and breadth of the planet each person in their turn gave their unequivocal support. In honoring Gene the industry is saying thank you for your tireless efforts to promote the science of supply chain and to instill in all who join the profession that supply chain is essentially all about people, passion and relationships.